The pervasion of mobile technology is on the rise in every extant sector. Construction sector too is not aloof to it. The acceptance of the digital revolution has come with a lot of facilitators. Among those facilitators, teeming phone applications and software lie in the vanguard. The advent of applications in Phones, Tablets and Laptops has further eased the individual as well as the overall workload. Be it a foreman, engineer or a project manager- Applications work as a panacea at sites. They allow you to multitask and keep you organized. Moreover, they come in handy in the situations where you require an instantaneous solution to a problem which otherwise would take days to solve. For example, being able to draw maps, complicated figures with precision, creating bar bending schedules and making heavy calculations right at the site within minutes is definitely something that would save a lot of your time and add up to the project profitability. A tad contentious, but technology has come with a smiley face for the users- It’s largely a boon. A great number of applications and software are being released every day to tackle complicated issues. Choosing the right ones from the potpourri of innumerable apps becomes extremely important. Instantly share real-time construction plans, markups, punch lists, submittals, photos, blueprints, daily construction reports, and safety checklists with the entire team, even offline. Keep everyone on the current construction set to easily and quickly track revisions, view document progress and manage issues in the field. The power of Procore’s cloud-based construction project management software on your Android phone or tablet. With a mobile project management solution, you have the freedom to move around the job site and stay up to date with the latest project details, no matter where you are, with or without internet. Take the power of AutoCAD wherever you go! AutoCAD mobile is a DWG viewing and editing app with easy-to-use drawing and drafting tools. View, create, edit, and share DWG files on mobile devices – anytime, anywhere. Simplify your site visits with the most powerful CAD app and do real CAD work on the go. Two in one: the official Construction Master® Pro from Calculated Industries for your Android device includes two models: #4065 and #4080 (CM Pro Trig). NOTE: the Android version of this app is compatible with Android devices only, you may install on as many as you own. eSUB Field Works allows you to securely create, store, and access all of your project’s daily reports, field notes, files, photos, contacts, and view RFIs from the field. Key Features: * Capture photos and annotate them from the field, while sharing them in real-time with the office and other eSUB users. Fieldwire connects your entire field team, from the project manager all the way down to each specialty contractor’s foreman, on one construction management platform. Making it effortless for anyone to view their drawings, schedule work and track their punch list while they are in the field. Invoice Simple is a fast and easy invoice app for sending invoices and estimates to your customers. Invoice Simple is perfect for small business owners, contractors and freelancers needing a simple and professional mobile invoicing solution. Create, send and track invoices and estimates easily on your phone. TSheets is a cloud-based time tracking and scheduling app that allows your employees to clock in and out from the job site with the devices they’ve already got in their pockets. Accurate, electronic time data replaces paper timesheets and makes payroll and invoicing faster and less costly. This Finite Element Method (FEM) app is especially useful for civil engineers, mechanical engineers, architects and students who wish to design 2D hyperstatic frames using Finite Elements Analysis (FEA). You can input and edit geometry, forces, supports, loadcases etc. The calculation results are performed instantly. Concrete Calculator is a free calculator with the following functionalities: -Calculate cement, sand and aggregate quantity in concrete. -Calculate the number of premix bags required for your project. -Option to set your own size and rate of premix bags. -Calculate the volume of concrete required for slabs, walls, footings and columns. Designed by a true rocket scientist, Truss Me helps you learn to design truss structures while having fun! At each challenge, design trusses that are light and strong and you will earn precious golden nuts. Truss Me utilizes state of the art simulation techniques used by aerospace, mechanical, and civil engineers to provide the most realistic behavior for your trusses. This Civil Engineering App is the One Full Stop Solution for All Civil Engineering Needs, It Contains Various Important Civil Engineering Concepts. 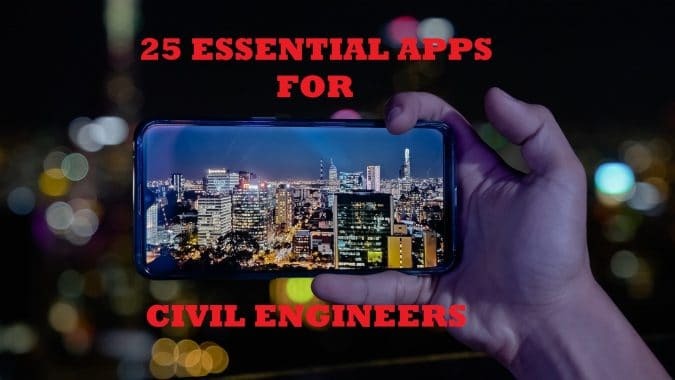 It almost Covers 300+ Civil Engineer related topics, which is useful for all civil engineering students as well as civil professionals.this is 100% free civil engineering app for the civil college students and site engineers. A simple tool to calculate how much concrete is needed for pouring slabs, footings, columns and steps. Concrete Calculator is a free calculator with the following functionalities: -Calculate cement, sand and aggregate amount in concrete. -How many premix concrete bags required for your project. -Option to set your own bag size and rate of premix bags. Beam sections for a variety of countries – Predefined European, US, Canada, Russia, UK, Australian and Japanese Steel Profiles – Parametric sections (circular, rectangular, H, I, U) – Freeform sections – Metric & Imperial (see options) – Login to sync your favorites across all your devices. RealCalc Plus is the pro version of Android’s most popular scientific calculator. RealCalc Plus is designed to look and operate exactly like a real hand-held calculator. It has all the standard scientific functions plus fractions, degrees/minutes/seconds, history, memories, customizable unit conversions and constants. You can choose from a number of display styles and formats. Complete construction calculator with simple inputs. The app for construction and DIY! Reduce Waste, Save Time and Money! Well tested by more than a million contractors and home owners! Top 100 productivity app. Give it a try! Calculate materials, track invoices, time spent, manage to-do list and save calculations to notepad. The biggest problem with the total station is its unavailability, it’s not difficult to learn its just not easily available, now with the Total Station simulator app we are going to solve that problem, you can learn total station for free from the comfort of your home. Create detailed and precise floor plans. See them in 3D. Add furniture to design interior of your home. Have your floor plan with you while shopping to check if there is enough room for a new furniture. Features: * Multi-platform application. * Projects can have multiple floors with rooms of any shape (straight walls only). Construction is Chaos. Fix it with Fieldlens. ** The flood of disorganized communication causes confusion, mistakes, and re-work. Connect everyone in real-time. Now you can address issues before they become problems. We built Fieldlens to solve problems we know first hand. Our team has worked on construction projects large and small. The powerful Excel spreadsheet app lets you create, view, edit, and share your files with others quickly and easily. It also lets you view and edit workbooks attached to email messages. Work in accounting, auditing, finance, or other fields, with anyone, anywhere with confidence. A bubble level, spirit level or simply a spirit is an instrument designed to indicate whether a surface is horizontal (level) or vertical (plumb), or lay it down on a flat surface for a 360° level. Spirit Level app is handy, accurate, simple to use and incredibly useful tool for your Android phone. Roofing Calculator Plus is the ultimate tool for carpenters involved in making timber roofing structures. COMPLETELY AD FREE A new and improved version of the hugely successful Roofing Calculator app. Simply enter the pitch and run to instantly get information including: – The rise of the common rafter per metre (or foot) of run.